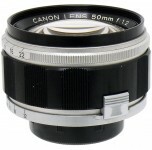 This attractive lens took the place of Canon's former 50mm f:3.5. This faster new unit made it the ideal universal lens not only mounted on the camera, but also for copy stand work, etc. Its very superior resolution made it ideal for reproduction work both in black-and-white and in color.